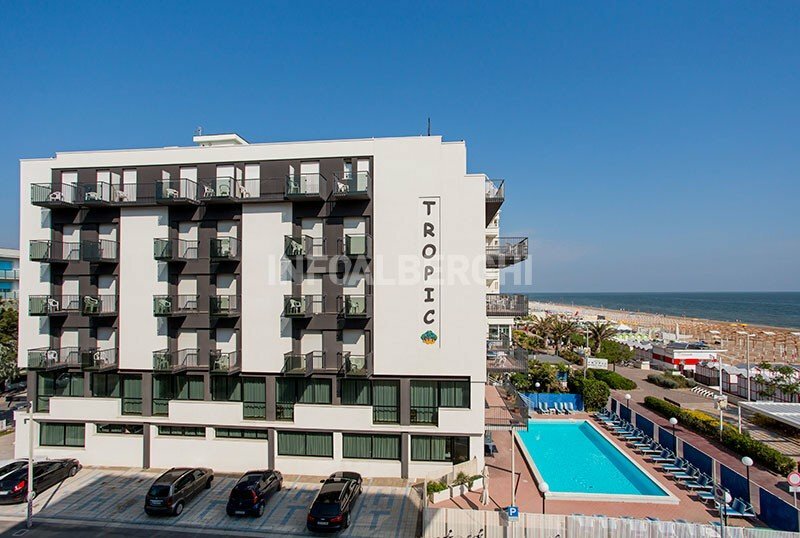 The Tropic Hotel in Riccione is a 3-star seaside hotel in a central location. Ideal for families, it has a large swimming pool with solarium area, garden, parking and facilities for the disabled. Accepts small and medium sized animals. The hotel is located in Riccione, overlooking Viale D'Annunzio, just a few steps from the beach and about a 5-minute walk from the dock. All rooms have a balcony with sea view, telephone, WI-FI, TV, minibar (on request), safe, private bathroom with shower and hairdryer. Heated pool equipped with sunbeds and beach umbrella, garden, free bicycles, elevator, living room, bar, restaurant with panoramic sea views, reading room with newspapers, Sunday drink. PARKING: uncovered, unattended and free, available as long as places are available in the hotel; for a fee fenced parking with shuttle service. AIR CONDITIONING: free also in the room. AGREEMENTS: beach, amusement parks, discos. SERVICES FOR DISABLED PEOPLE: entrance on the ground floor, lift for disabled people, rooms with wheelchair space. However, almost all the bathrooms have a step and no bathroom has grab bars. BREAKFAST: sweet and savory buffet, can be consumed in the lounge bar or by the pool. LUNCH AND DINNER: fine and varied cuisine with a 2-choice menu, vegetable buffet. Meals are served in the panoramic restaurant on the first floor. CHANGES: menu changes are possible, such as vegetarian dishes. In the hotel: strollers. Baby sitter and pediatrician on request. The garden has a heated swimming pool surrounded by a solarium area equipped with beach umbrella and sunbeds. Guests have private cabins available at the partner establishment, beach n. 102 - 103. Many services are available to guests including a fitness area, sports courts, entertainment, a children's playground area and canoe rental. Prices are for stays of at least 3 days per person per day and include 10% VAT. Free Kids Offer for the whole summer 2019! From 10 May to 20 September (except from 10 to 20 August), a child up to 5 years is FREE! Free Kids Offer for the whole summer 2019! From 10 May to 20 September (except from 10 to 20 August), a child up to 5 years is FREE! Special offer book your summer 2019 in Riccione! For a minimum stay of 3 nights, from 10 May to 20 September, booked before 30 April, a 10% discount on the list price will be applied. What are you waiting for? Call us for a personalized quote and to guarantee the best price.